The Leadership in Women’ s Sailing Award, co-sponsored by NWSA and BoatU.S., the nation’s largest organization of recreational boaters, begun in 1990. The award is given annually to honor an individual who has a record of achievement in inspiring, educating and enriching the lives of women through sailing. 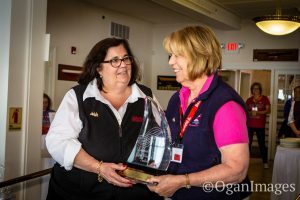 In recent years, the award has been made at the Women’s Sailing Conference in Marblehead, MA usually held the first weekend of June. Sheila McCurdy of Middletown, Rhode Island, was awarded the BoatUS/National Women’s Sailing Association (NWSA) 2018 Leadership in Women’s Sailing Award at the NWSA Women’s Sailing Conference held Saturday in Marblehead, Massachusetts. The award, which recognizes an individual with a record of achievement in inspiring, educating, and enriching the lives of women through sailing, was presented by NWSA President Linda Newland. McCurdy is a trustee of Mystic Seaport Museum, serves on the board of Ida Lewis Yacht Club, and was the first female commodore of the Cruising Club of America, and served as a director of US Sailing Association where she ran the national faculty for 13 years. She was an advisor to the US Naval Academy Sailing for 20 years. She maintains a position on the Advisory Council of the National Women’s Sailing Association, writes and lectures on education and training, runs safety training courses and certifies instructors for the U.S. Sailing Association. McCurdy also holds a U.S. Coast Guard 100-ton master’s license and a masters degree in Marine Affairs from the University of Rhode Island. She has received several awards, including Rhode Island Boater of the Year 2011. She is married to David Brown. Linda Lindquist-Bishop who was a member of the first and only all-women’s America’s Cup team was honored at the conference for her contribution to women in the sport. Lindquist-Bishop was awarded the 2017 BoatUS/NWSA Leadership in Women’s Sailing Award. Lindquist-Bishop became the first female sailing master at her yacht club. She achieved a leadership role on the SC70 team setting records on the Great Lakes. She was also a member of the first all-women’s America’s Cup sailing team. Lindquist-Bishop has sailed with more than 100 teams and won two world championships. “Linda has made a significant impact on improving the confidence of young women through international sailing competitions,” NWSA President Linda Newland said. “She is a role model for what can be. We are pleased to recognize her commitment to women in sailing with this award.” Lindquist-Bishop is a co-founder of Rising Tide Leadership Institute, a non-profit organization. She also helped to develop the NWSA and is on the advisory board. We are always grateful to our sponsors Boat/US and Black Rock Sailing School together with the Corinthian Yacht Club who help us bring great women to the conference each year. NEWPORT, Calif., May 9, 2016 – At opening day festivities held this weekend at Bahia Corinthian Yacht Club, Ms. Kathie Ohmer-Arnold of Aliso Viejo, CA was named the 2016 recipient of the Leadership in Women’s Sailing Award. A joint honor of the National Women’s Sailing Association (NWSA) and Boat Owners Association of The United States (BoatUS), the award recognizes a woman with a record of achievement in inspiring, educating, and enriching the lives of other women through sailing. Southern California Yachting Association (SCYA) Staff Commodore Gail E. Hine, the 2002 recipient of the Award and Member of the Women’s Sailing Foundation Board of Directors, presented the honor on behalf of NWSA and BoatUS. As a teen, Ms. Ohmer-Arnold began sailing dinghies in California’s Newport Harbor and then later raised a family. After the kids grew up, she sailed to Europe and into the Mediterranean and before returning to the West Indies logging over 10,000 miles. In the islands she acquired her 100-ton Master License, was first mate on a Hatteras 70, worked as a charter captain on a 44-ft ketch, taught local women how to handle large boats by themselves, and raced J-24s in her spare time. Returning to California in 1988, she continued involvement in sailing, starting in Dana Point with the repair and restoration of historic sloop Virginia. She also taught Sea Scouts how to sail, became a instructor with Orange Coast College of Sailing & Seamanship, and over the next nine years taught over 500 women to sail aboard the school’s 47-foot Saudade. In the 90’s Kathie was active in the precursor to the Women’s Sailing Association of Orange County, was a supporter of the Sail for the Visually Impaired, and joined Bahia Corinthian Yacht Club (BCYC) where she sailed her Catalina 34. At BCYC, Kathie mentored many female members, being active in their social events, club cruises, and junior activities as well. She served as Port Captain and also as Fleet Captain at BCYC and participated in H/20 harbor races. Kathie supported the Leukemia Lymphoma Society charity regatta and invited young leukemia survivors aboard on her boat for a number of years Kathie has been an instructor/coach for the SCYA’s Women’s Sailing Convention for the past 25 years and second-in-command. She is responsible for the annual event’s coach coordination, boat donations and participant on-the-water workshop assignments. June 6, 2015 — Sally Helme, of Newport, RI and publisher of Bonnier Corp.’s Cruising World and Sailing World magazines, has been honored with the 2015 Leadership in Women’s Sailing Award. Added Newland, “As a young woman, Sally sailed for her college team and subsequently began to get more involved, eventually earning seats on several boards and committees that support and promote sailing, particularly for women.”Helme also worked with Offshore Sailing School CEO Doris Colgate to create and sponsor NWSA’s Take the Helm series of women’s educational and networking events. “I have always believed that women can have a significant impact on our industry, and it’s been my goal to spread that idea and encourage more efforts to meet the needs of this very important market,” said Helme. “I have also always valued what sailing can bring to our lives — providing a wonderful escape, instilling a sense of confidence and self-reliance, and simply offering cherished time on the water with friends and family.” Inside the marine industry Helme remains a role model for women. Climbing the corporate ladder to the pinnacle of two very widely read and respected sailing magazines, Helme was the first female publisher in the sailing industry. She advocated for positive depictions of women in the magazines, showing them in leadership roles on boats, on boards, in competitions, and in photos and articles to inspire and illustrate the many challenging aspects of sailing. “She works to inspire and lead women to enjoy sailing as much as she does,” said Newland. Helme is a past president of Sail America, the trade association for the US sailing industry that plays a vital role for all sailing-related products and services companies. She has served on the boards of Sail Newport and US Sailing, and is currently a vice president of Marine Marketers of America. Helme was also a founding member of International Women in Boating, a marine industry professional-development organization for women. In 2011 Helme was honored with the SailMagazine Industry Leadership Award, and in 2014, the Rhode Island Marine Trade Association Anchor Award. June 4, 2011 — Dawn Santamaria – Recipient of the 2011 Leadership in Women’s Sailing Award, accepted her honor June 4th at the 10th Annual Women’s Sailing Conference held at the Corinthian Yacht Club in Marblehead, Massachusetts. Photo Caption: (Left to Right) NWSA Founder Doris Colgate, NWSA President Joan Thayer, 2011 Award Recipient Dawn Santamaria, BoatUS Membership Programs Manager Dina Murray When Dawn and her husband Jay purchased their tall ship, she witnessed first hand how their four young daughters enjoyed learning how to sail the ship while gaining confidence and leadership skills. She wanted other young girls to have the opportunity to have the same experiences so she developed a program and created the non-profit organization, Sisters Under Sail, in 2005. The mission of Sisters Under Sail is to build confidence, enhance self-esteem, develop social conscience and teach women of all ages the value of sisters working together towards a common goal through sail training. Its classroom is the 110-foot, square topsail, gaff-rigged schooner STV Unicorn, said to be the only all-female crewed tall ship in the world. This unique leadership program has taken nearly 400 girls aboard from all over the United States and Canada to learn new skills on the ship and expand their lives with accomplished sailors. Unicorn sails in alternate years on the Long Island-Maine route and in the Great Lakes. Santamaria grew up in Chicago, Illinois and attended Saint Mary’s College in Notre Dame, Indiana – an all women’s college. Three of her four daughters have also gone to Saint Mary’s, making a family that understands the value of the “Sisters” mission and its impact on teenage girls. Her adult program has brought aboard nearly 200 women who have enjoyed the experience as much as the teenage girls. Sisters Under Sail has worked with the generous support of communities, individuals and many organizations such as Girl Scouts of America wishing to sponsor teenagers to participate. Dawn, still connected to her college community, is on the Alumnae Board of Directors at her alma mater, and is Saint Mary’s New Jersey Alumnae Club President. She serves as the Chairwoman of the Sisters Under Sail Board of Trustees. You can follow the travels of Unicorn on the website sistersundersail.org anytime. In 2012, Unicorn will be sailing in OpSail 2012, with the daughters of deployed American service men and women next summer, from New York City to Norfolk and from Baltimore to Boston, commemorating the bicentennial of the War of 1812 and the birth of The Star-Spangled Banner, working with a Washington, DC based military strategic partner. ALEXANDRIA, VA, June 9, 2009 — Proving that despite a major setback, the will to sail and compete at the highest level can prevail, Maureen McKinnon-Tucker was honored with the annual Leadership in Women’s Sailing Award at ceremonies capping the day-long Women’s Sailing Conference held June 6 at Corinthian Yacht Club in Marblehead, MA. The award is co-sponsored by BoatU.S. and the National Women’s Sailing Association. The award honors a male or female who has a record of achievement in giving something back to the sailing community as well as inspiring and educating women. McKinnon-Tucker was featured in the “Top Women in American Boating” article in the May 2009 issue of BoatU.S. Magazine. Over a decade ago she fell off a seawall and the injuries left her partially paralyzed. Despite using a wheelchair, she has doggedly pursued competitive sailing. After being the first woman named to the U.S. Disabled Sailing Team and winning a silver medal in the 2007 world championship, McKinnon-Tucker went even further in 2008 and won a gold medal in the Beijing Paralympic Games, along with the late Nick Scandone in the SKUD-18 class. In presenting the award at the conference, Elaine Dickinson, coordinator of BoatU.S.’s Women in Boating initiative, said, “Maureen’s indomitable spirit and upbeat attitude are the essence of what leadership is all about. She turned adversity into achievement and inspires everyone who meets her or hears her story.” She has also served on numerous boards and committees advocating for those with spinal cord injuries and is a peer mentor for those recently disabled; she is the adaptive sailing coordinator at the Piers Park Sailing Center in Boston, MA. The mother of two has also managed two businesses. McKinnon-Tucker was not able to accept the 2009 leadership award in person at Marblehead as she was competing in a race the same day in New York, but sent a videotaped message expressing her gratitude for the recognition and those who helped her get back into her chosen sport. She is a Marblehead, MA, resident and her web site is SailChallengeInspire.org. Pat Seidenspinner holds the award, second from right, along with NWSA President Valli Cook, at left, BoatU.S.’s Susan Shingledecker, second from left, and Conference Chair Joan Thayer, at right. Underscoring that volunteer race managers are the backbone of competitive sailing, Patricia Harvey Seidenspinner of St. Petersburg, FL, was honored with the annual Leadership in Women’s Sailing Award at ceremonies capping the day-long Women’s Sailing Conference held June 7, 2008, at Corinthian Yacht Club in Marblehead, MA. Both the award and the conference are sponsored by BoatUS and the National Women’s Sailing Association (NWSA). The award honors a male or female who has a record of achievement in giving something back to the sport of sailing as well as inspiring and educating women. “Pat Seidenspinner has such an impressive list of ‘firsts’ in her sailing resume,” said BoatUS Assistant Vice President Susan Shingledecker in presenting the award with NWSA President Valli Cook. “She has given an extraordinary amount of her time and expertise to grow the sport and inspire more women and girls to get involved in racing. Beyond the local level, she’s also volunteered for national leadership positions to improve race management across the board,” added Shingledecker. Seidenspinner is a native of New York City who grew up in Rochester, NY, and enjoyed a career as a flight attendant with TWA. She and her husband sailed in their time off, but upon retirement to St. Petersburg, Seidenspinner became very active in race management and eventually managed many national and world sailing championships. She is a member of US SAILING’s Race Management Committee and is the editor of its Race Management Handbook. She served as Chairman of the Race Administration Committee, and as a member of both the Board of Directors and Executive Committee. Among some of her “firsts” in her sailing career, she was: 1st female Principal Race Officer, Southern Ocean Racing Conference and many other championships at St. Petersburg Yacht Club 1st female appointed as International Race Officer by the International Sailing Federation 1st female Principal Race Officer at an Olympic Games 1st female Commodore of St. Petersburg Yacht Club. Sadly, in June 2014, after a series of illnesses, Pat Seidenspinner passed away. She will be greatly missed. June 6, 2007 Marblehead , MA – The Leadership in Women’s Sailing Award was presented to Janet Baxter, a Chicago-based racer, sailing judge and the first woman elected president of United States Sailing Association, the national governing body of the sport in the US. The award was given during evening festivities at the sixth annual Women’s Sailing Conference hosted by the Corinthian Yacht Club. The event is organized by the National Women’s Sailing Association with BoatUS as primary sponsor. Janet Baxter was instrumental in preparing US SAILING for the future, leading a comprehensive reorganization of the group. In accepting the award, Baxter spoke graciously about how sailing has enriched her life and cemented friendships that last a lifetime. She’s raced in 27 Chicago-to-Mackinac races and excelled in racing Lasers, Etchells, as well as offshore boats. She is a member of the Chicago Yacht Club. June 2006 – Nancy Erley, a Seattle-based sailing instructor and two-time circumnavigator, was presented with the Leadership in Women’s Sailing Award for 2006 this weekend at the fifth annual Women’s Sailing Conference held at the Corinthian Yacht Club in Marblehead, MA. Sponsored by the Boat Owners Association of The United States (BoatU.S.) and the National Women’s Sailing Association (NWSA), the award honors a male or female who has built a record of achievement in inspiring, educating and enriching the lives of women through sailing. Erley holds a 50-ton Master of Oceans and 100-ton Master Near Coastal license and is an instructor-evaluator for the International Sail and Power Association. She led two all-women voyages from Seattle around the world aboard her Orca 38 sailboat Tethys , which one boating writer called a voyage “that should go down in the record books as one of the soundest, most seamanlike journeys of the modern cruising era.” As founder of the Tethys Offshore Sailing for Women in Seattle (www.tethysoffshore.com) Erley teaches women beginning sailing up to captaining skills, either on learning cruises or individually. She’s a Ham operator as well as advanced SCUBA diver, and delivery captain. January 2005 – Cory Sertl, a world-class sailor and youth coach, was presented with the Leadership in Women’s Sailing Award for 2005 for her outstanding contributions to the sport. Sponsored by the Boat Owners Association of The United States (BoatU.S.) and the National Women’s Sailing Association (NWSA), the award honors a male or female who has leveraged their name, skills, or position in the sailing world to reach out and enrich women’s lives through sailing. Among Sertl’s many accomplishments: Member of US SAILING’s delegation to the International Sailing Federation (ISAF) Coaches high school sailing at Rochester Yacht Club, Rochester, NY Skipper of the team that won the 2004 U.S. Women’s Match Racing Championship. Two-time Rolex Yachtswoman of the Year, a former Olympian, and a winner of the Rolex International Women’s Keelboat Championship. Winner with Jody Swanson of the Women’s Open Doublehanded Championship in 1990 and the U.S. Women’s Championship for the Adams Cup in 1992. Served on US SAILING’s Women’s Sailing Committee Cory Sertl joins a distinguished list of past awardees who have also contributed in unique ways including Bernadette Bernon, Betsy Alison, Gail Hine, Dawn Riley and Doris Colgate. June 8, 2004 – Doris Colgate, President and CEO of Offshore Sailing School was presented with the Leadership in Women’s Sailing Award for 2004 this weekend at the 3rd annual Women’s Sailing Conference held at the Corinthian Yacht Club in Marblehead, MA. Sponsored by the Boat Owners Association of The United States (BoatUS) and the National Women’s Sailing Association (NWSA), the award honors a male or female who has leveraged their name, skills, or position in the sailing world to reach out and enrich other’s lives through sailing. Doris has served on the BoatUS National Advisory Council as well as the board of directors and marketing committee of Sail America, the sailing industry association. Colgate joined Offshore Sailing School as its vice president in 1970, became president in 1978 and CEO in 2001. Now in its 40th year, Offshore Sailing School has grown from a one-branch, two-boat operation to 10 sailing schools and a retail sales division for their Colgate 26 training boat. Within the schools’ offerings, Doris created innovative women’s educational courses and cruises. In 1990, she founded the National Women’s Sailing Association (NWSA) to create more sailing opportunities for women and educational offerings for women to build confidence and skills. Doris also helped NWSA launch AdventureSail in 1991, a sailing-mentoring program for at-risk girls. In 1997, she established the Women’s Sailing Foundation (WSF) a not-for-profit organization dedicated to enhancing the lives of women and girls through education and access to the sport of sailing. Author of SAILING: A Woman’s Guide (International Marine/McGraw Hill), Colgate received the 2000 Southam Award in the book category. Colgate received the Betty Cook Memorial Lifetime Achievement Award from Boating magazine and International Women in Boating for her work in the marine industry. In 1996 she shared with Steve Colgate, the Sail Magazine Industry Award for Leadership. And in 2003, US SAILING, the national governing body of sailing in the U.S., awarded Steve and Doris the Timothea Larr Trophy for their leadership and excellence in sailing education. At the Women’s Sailing Conference over 100 women – from college students to grandmothers – learned new skills as well as brushed up on old ones and networked with other women sailors. The Conference is one of many events that BoatUS – with 565,000 members – sponsors that promotes boating opportunities for women. Others include the BoatUS Santa Maria Cup/ISAF Women’s World Matching Racing Championship. Dawn Riley, the world champion sailor who has made great strides in developing sailing outreach programs for young people, was presented with the Leadership in Women’s Sailing Award this weekend at the 2nd annual Women’s Sailing Conference held at the Corinthian Yacht Club in Marblehead, MA. Sponsored by the Boat Owners Association of The United States (BoatUS) and the National Women’s Sailing Association (NWSA), the award honors a male or female who has gone beyond competitive racing and leveraged their name, skills, or position in the sailing world to reach out and enrich other’s lives through sailing. “No one is more deserving of this honor than Dawn Riley,” said Elaine Dickinson of BoatUS, who presented the award along with NWSA President Diana Smith. “Her racing career has been extraordinary, breaking numerous barriers for women. But she’s also gone beyond winning trophies to give something back to the sport and to society at large through her America True Foundation.” Riley founded and leads the America True Foundation, whose goal is to bring the joy of sailing to youth nationwide. Other accomplishments include being the first woman to head up an America’s Cup Syndicate (2000) as well as team captain of the first all-women’s America’s Cup team, America3 (1995). She was the only female crew member on an America’s Cup team in 1992 and she led the Heineken team, the all-women’s entry in the Whitbread Round the World Race (1993-94). Riley was the first two-time winner of the world-class BoatUS Santa Maria Cup women’s match race regatta; the first sailor to be named President of the Women’s Sports Foundation; and also the 1999 Rolex Yachtswoman of the Year. January 2002 – Gail Hine, one of the first female sailors in the U.S. to organize large-scale training events just for women, was awarded the third Leadership in Women’s Sailing Award at Sail Expo in Atlantic City, NJ, Jan. 25. The award, which is given annually, is co-sponsored by the National Women’s Sailing Association and BoatUS, the nation’s largest organization of recreational boaters. “The Leadership in Women’s Sailing Award is given to a person who has a record of achievement in inspiring, educating and enriching the lives of women through sailing,” said Elaine Dickinson, managing editor of BoatUS Magazine and a member of the board of directors of the National Women’s Sailing Association. She presented the trophy along with Doris Colgate, founder of NWSA and CEO of Offshore Sailing School. Said Richard Schwartz, BoatUS founder, “Thousands of women in California have either been introduced to sailing or improved their skills because of Gail’s efforts. She has a truly remarkable combination of sailing knowledge, organizational skills and, boundless energy. For over three decades Gail has volunteered her time to expand the sailing arena for women.” The 13th annual Women’s Sailing Convention will be held Feb. 2 in Corona del Mar, CA, and 330 participants will be involved in some 30 seminars both on the water and in the classroom, led by expert women instructors. Relying extensively on grassroots organizing, Gail brings together this event each year with donated time, donated boats and equipment. BoatUS is the title sponsor of the Women’s Sailing Convention. Hine was also one of the first women in California to be elected commodore of a yacht club, Palos Verdes, which later named a perpetual trophy for her. In 1990, she was the first woman to be named “Yachtsman of the Year” — the Peggy Slater Award — by the Southern California Yachting Association. She has served on boards and committees too numerous to list and has made a significant contribution to improving boating in California through legislative advocacy work when she served as president of Recreational Boaters of California, a statewide organization. During her term in office she also served on the BoatUS National Advisory Council. Gail still finds time to race her Nightingale 24 in local regattas. Betsy is the top-ranked U.S. women’s match racer holding 22 national and international titles, and mentor to young people in numerous sailing programs. As coach, Alison led the U.S. Disabled/ Paralympic sailing team to a Bronze medal. With her is Doris Colgate, at left, president of the National Women’s Sailing Association, and Becky Squires, director of public relations for BoatUS The annual award is jointly sponsored by NWSA and BoatUS. The 2000 recipient is Betsy Alison, one of the top-ranked women sailors in the U.S. and the world. She has the number one ranking in the U.S. for women’s match racing and is ranked second in the world. Her current goal is to win an Olympic medal in 2004 in the new women’s keelboat discipline in the Olympic Games to be held in Athens, Greece. But Betsy has done much more than race and much of her leadership has been in advising and coaching disabled sailors. She recently coached the U.S. Disabled/Paralympic Sailing Team to a bronze medal in Sydney. She has also volunteered her time to the National Women’s Sailing Association’s AdventureSail® program which reaches out to inner city and at-risk young women. Alison holds 22 national, international and world sailing titles.